I’m going to start by saying, I’m not very good at being a geek. Sure, I like ST:TNG and the original Star Wars movies. I’ve seen a couple of Monty Python flicks. My brother and I owned a Sega Genesis back in the day (although we only owned the game that came with it – Sonic the Hedgehog – so that should tell you something right there about our commitment level to gaming). I know who Wil Wheaton is, and I know why he is so beloved on the interwebs years after TNG ended. I even know how to handle a number of computery problems by myself (though, again, the fact that I even used the word “computery” gives you an idea of my depth of expertise). I’ve watched most of Ranma 1/2 in the original Japanese, and my first really big celebrity crush was on Jonathan Frakes. My only strong interests in geekdom currently, however, are in fantasy and sci-fi literature and in the mildly appalling fact that I occasionally get sucked down fan fic wormholes. I’ve never been to a con. I can’t stand reading graphic novels (not because they aren’t cool, but because it hurts my eyes and brain when I try to process information that way). My closet is filled with many non-black tee shirts. I have the attention span of a gnat for any kind of video game, and probably most damning of all, I’m a morning person. That being said, I married a geek. One of my best friends is a geek. In fact, many of my friends are insanely geeky, awesome, stupefyingly brilliant people, and I’m often jealous of the cozy little world that has evolved alongside the internet, allowing geeks to rise up their proper place in the social order. When my husband and I first started dating, he even gave me a copy of The Geek Handbook, which I read cover to cover that very night (I’m also not a procrastinator, which I’m pretty sure bans me from full geek status on its own). I then went on to let him know exactly how and why I already knew all about the care and handling of geek humans – which might have been the moment he fell for me. I was raised on the edge of geek culture, and I’ve always enjoyed it – even the parts I didn’t understand (and there are many) – maybe that’s why I fell in love with Ready Player One before I finished the first chapter. It was like reading little bits of history out of the lives of so many people I love. I have no doubt that Cline is a supreme geek, aw=s well as knowledgable in the extreme about 80s culture, and reading his story (because you can’t be even a little bit geek without this sort of being your story too), I was sucked in. The funniest thing is, it takes place almost entirely inside a virtual reality gaming system, and one of my worst nightmares is that someday the world will be so bad, or so bored, that this is what will happen. The lines between reality and gaming will blur almost to extinction. We’ll all be living in an artificial world because the real one is just not enough. This scares me more than being caught on a suspension bridge during a huge earthquake. Or drowning. Or that scene in Indiana Jones where he falls into a train car full of snakes…and that scares me a lot. I would never want to live in a world like that, not even if it meant I could control an avatar that was fiercer and more graceful than I am. It might allow me to do all the things I could ever dream of, but at the end of the day, I would know that I hadn’t done anything at all, and I think it would break my heart. Because honestly, he makes it seem pretty great. 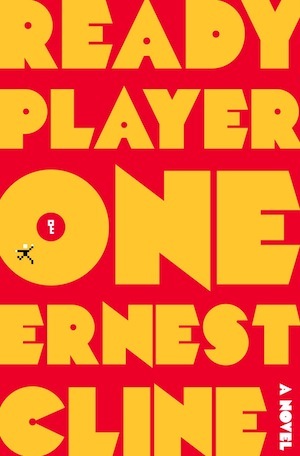 Ernest Cline can be found at http://www.ernestcline.com/. Also, I hear the audio version of this book is pretty fabulous (and narrated by Wil Wheaton), so if that’s more your speed, definitely check it out at your local library or on audible.com. A clergy read … OK you figure it out.